I haven’t really had a chance to pick up the camera in the past few days and, as you can imagine, I started to get a little bit antsy. I brought the camera to work today and took a look at Google maps. There happens to be a little watering hole not far from work and with the sun shining I figured it would be a great place to see if I could get a few shots. It was definitely strange to pick up the camera, boy did I miss it. I can’t do this 2 week layoff again. The sun was shining and then it would hide behind the clouds and it even started to sprinkle for a few minutes. 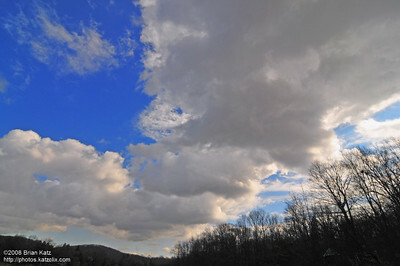 The clouds looked awesome so I took a nice wide shot with them hugging the tree line. Here’s the shot that stood out a little bit on a first pass. (I will look at the rest later – if soccer doesn’t get in the way ).